qualified Degree in Science or Engineering Subjects they are eligible for applying this Forest Range Officer Posts. Online applications for these APPSC Forest Range Officer vacancies will be available from 10-12-2018 to 31-12-2018. APPSC Forest Range Officer Posts selection will be based on Screening test/ Mains Examination and Physical Examination. Screening test or Preliminary test only conducted if applications are more than 25000. 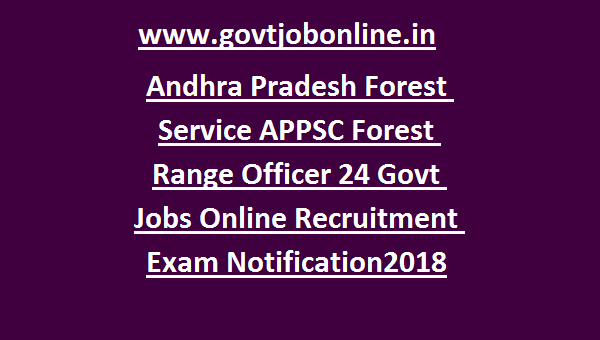 Detailed information about this APPSC Forest Range Officer Posts Exam Pattern and Syllabus, Selection process, how to apply and other details are given below. 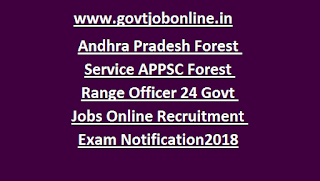 There are total 24 Forest Range Officer jobs in this Andhra Pradesh Forest Service APPSC recruitment 2018 notification. Age limits for FRO Posts is 18-28 years as on 01-07-2018. For SC/ST/BC candidates age limits are 18-33 years. Those who qualified Degree in these subjects (I) Agriculture (II) Chemistry (III) Botany (IV) Computer Applications / Computer Science (V) Engineering (Agriculture / Computer / Electrical / Chemical / Civil / Electronics / Mechanical) (VI) Environmental Science (VII) Geology (VIII) Forestry (IX) Physics (X) Mathematics (XI) Horticulture (XII) Veterinary Science (XIII) Statistics (XIV) Zoology they are only eligible to apply for this FRO jobs of AP Forest Service. Exam fee is exempted for reserved candidates. Candidates selection for this APPSC FRO jobs will be based on Screening test, Mains Examination and Physical /Medical Tests. For Men-25 Kms walking to be completed in 4 hours. Fo Women 16 Kms walking to be completed in 4 hours. Apply Online for this APPSC FRO jobs through official website of www.psc.ap.gov.in. Last date to submission of application form online is 31-12-2018. Exam Syllabus and Pattern, Admit Card, result and other details about this APPSC FRO Jobs will be updated in this website only.